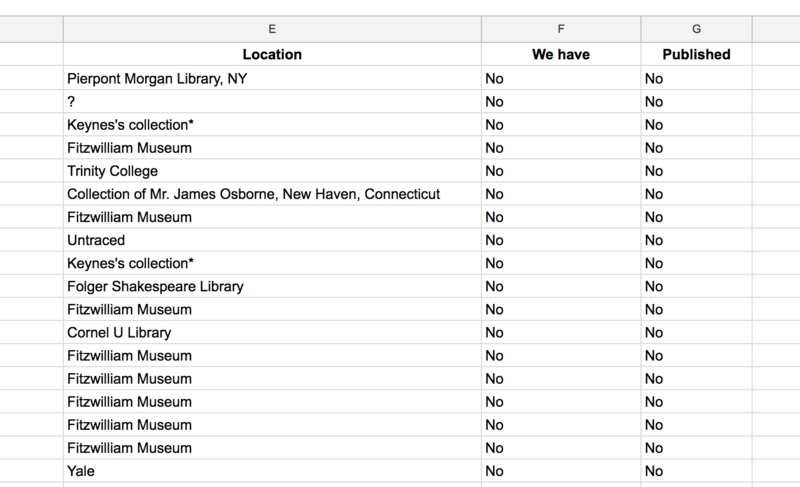 The goal was to compile a Letters Master List: a comprehensive database of letters and their locations. The first sources I consulted for this kind of information were Geoffrey Keynes’s The Letters of William Blake 3rd Ed. (1980), G.E. Bentley Jr’s William Blake’s Writings Vol II (1978), and David V. Erdman’s The Complete Poetry & Prose of William Blake (1988). One of the things I noticed is that these books contain a large number of letters by people other than William Blake. 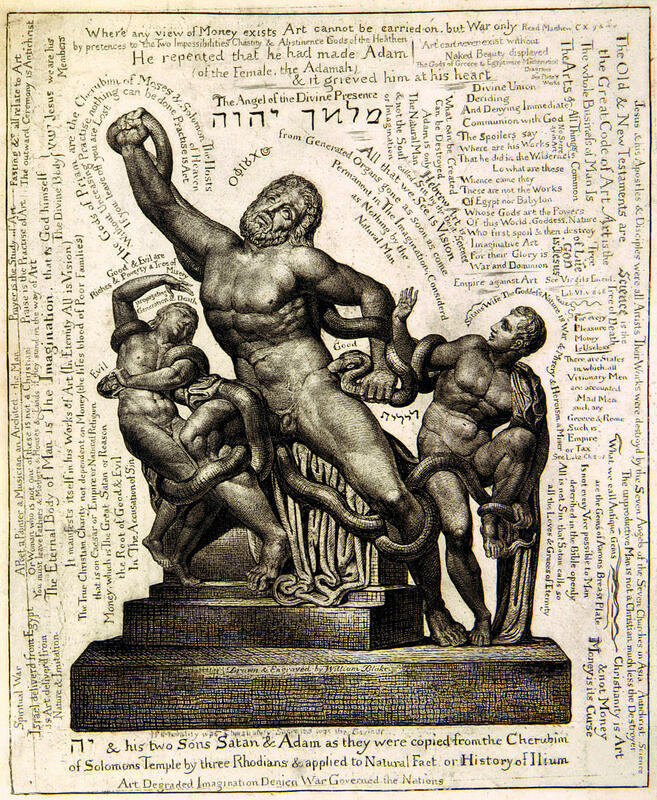 In some cases Blake is the recipient of the letter, in others he is the subject. I’m not sure what the Archive’s policy on such letters should be. On one hand, we have already published one non-Blake letter: George Cumberland’s 15 August 1827 letter to Samuel Palmer on the topic of Blake’s death. There are also a few letters to Blake in the upcoming batch. 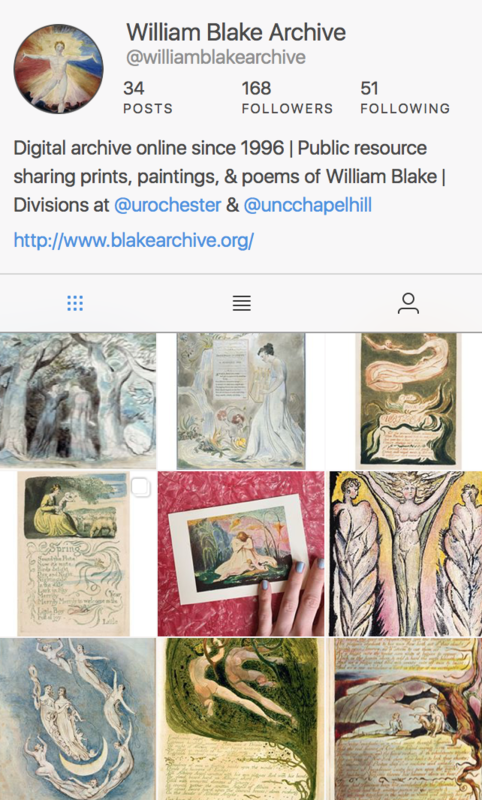 On the other hand, the fact that only a few of the 81 letters we have are written by someone other than Blake suggests that we have made the letters written by Blake a priority, which makes perfect sense. I have decided not to make any judgement calls for now regarding the relevance of the letters not by Blake featured in Keynes, Bentley and Erdman. It is better to have them all in the database now than to have to go back through the whole compilation process again later. For that matter, not every item in the “Letters” sections of these books would qualify as what most people would call a “letter.” For example, Keynes includes the speech that Samuel Rose gave in defense of Blake during his trial for sedition “taken in short Hand by the Revd. Mr. Youatt” (Keynes 75). He also includes many works that the Archive classifies as “receipts.” I have not been adding receipts to the Letters Master List because we have accounted for them elsewhere as receipts, but I have been adding other documents in the “letters” sections of Keynes, Bentley and Erdman to the list, even those which aren’t technically “letters.” For the sake of simplicity and in accordance with precedent, I will continue using the term “letters” to refer to the group of documents, but the term doesn’t necessarily describe every item on the list. I should also note that I have included “untraced” letters, i.e. letters known to have existed at one point, but which may or may not still be out there somewhere. It could be argued that these “untraced” letters constitute a somewhat different category than the letters that have been found and are known to be housed in specific institutions (from which we could potentially get permission for images), but it’s still good information to have. These “untraced” letters do sometimes have a way of being discovered even after so many years in hiding. 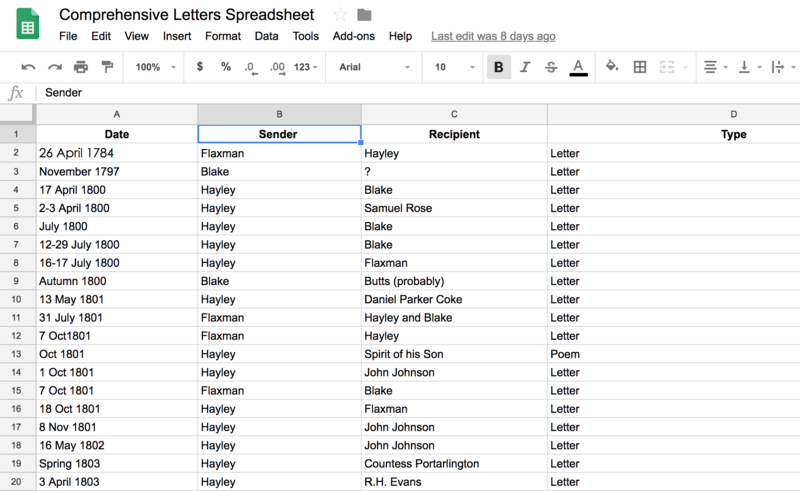 When I finished going through and adding letters to the list it contained a total of 66 items, 26 of which are letters by Blake, and another 8 of which are letters written to him. So what did I find? In short, the letters are very widely dispersed! There is no single institution we could contact that would have most or even many of them. Nine of the letters on the list are in the Fitzwilliam Museum, but of these nine Blake is the author of none and is only the recipient of one. The Historical Society of Pennsylvania has two relatively long letters written by Blake to William Hayley on March 21st and December 28th of 1804, the latter of which includes Blake’s reaction to the death of Samuel Rose. Trinity College in Hartford, Connecticut has a lot of material pertaining to the John Scofield incident and Blake’s trial for sedition, including the single piece of paper containing both Scofield’s information and complaint, and Blake’s memorandum against Scofield from August 1803. They also have a copy of Samuel Rose’s speech in Blake’s defense and a few letters by Blake, one from March 31st 1804 to Hayley, and the other a much later letter to Ozias Humphrey in 1809. While a few institutions thus stood out as containing multiple items of significance, otherwise there were almost as many locations as letters. Blake’s October 7th 1803 letter to Hayley was until very recently in the hands of a private owner named Mary Hyde but is now at Harvard University. That one is actually a really interesting one, because it was written in the aftermath of the Scofield affair when Blake had returned to London ill and was having trouble finding work, in spite of the copious demand for engravers and the “many works of a lucrative nature. . . in want of hands” (Keynes 69). Another Letter Blake wrote to Hayley not long after that one (13 December 1803) is in the possession of the Maine Historical Society. 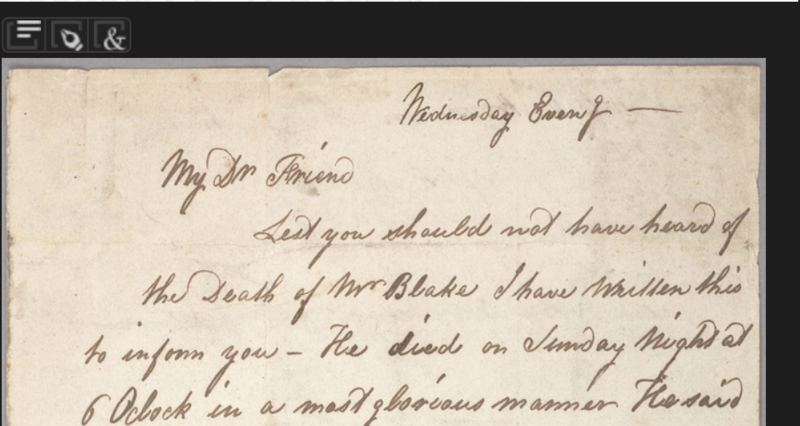 This letter reveals a marked improvement in Blake’s life in the months following the October 7th 1803 letter. In an October 14th 1807 letter to Richard Phillips (currently in the Boston Public Library), Blake expresses his indignation at the arrest of an unnamed astrologer and his insistence that the letter itself be published in Monthly Magazine (it wasn’t). So there are a lot of Blake letters not yet in the Archive, including some really interesting ones! Personally, I think if we were going to pick one institution to get in touch with Trinity College would be a good choice given both the sheer volume of material it has and the compelling nature of the subject matter. Of course, as described above, there are plenty of great potential acquisitions in a variety of places. But the next step for me is to try to learn more about recent developments, such as discoveries of previously “untraced” letters or changes in ownership or location of extant letters, so as to ensure that the information in the database is as up-to-date as possible.